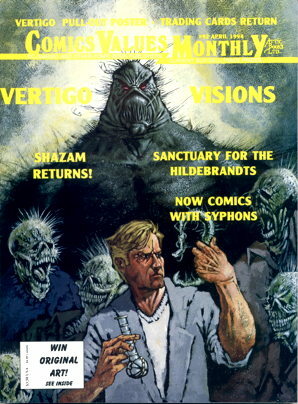 I honestly have nothing against the Syphons comic book. So the other day on Twitter I was reminiscing about the influx of comic book price guide periodicals that flooded…well, wait, hold on, let me back up. A little bit of Googling later, I found this article saying that Wizard is being relaunched as a digital “service,” with a quarterly magazine and a daily video thingamajigger. No word here on whether a price guide is part of the quarterly release, which, judging by my retail experience selling the magazine for its entire existence, was the magazine’s primary attraction. Okay, I exaggerate, but really, not by much. I’ve heard more than once “ Wizard ‘s gone!? Then how do you price your comics?” But the magazine’s appearance and content skewed young-ish, appealing to the teen crowd of comic readers that were then heavily populating the marketplace during the industry’s boom years. Features on “hot” comics and creators, pack-in freebies like trading cards (also “hot” for a time), offers for special “limited edition” comics…there was a lot of material to attract fans of a certain type, and there was nothing else quite like it on the market…at least until Hero Illustrated showed up. Anyway, to get back where I started, this got me to thinking about the many other price guides that suddenly turned up during the last time lots of people remembered that comic books existed as items they could purchase. I’ve already mentioned Hero Illustrated , which was basically the same thing as Wizard , with articles that perhaps aimed at a very slightly older reader, but still had that big ol’ price guide section in the back. As I recall, the major difference from Wizard was that Hero sometimes offered “ashcan editions” (i.e. digest sized previews of comics) as pack-ins, along with the usual trading cards, etc. Going a slightly different route was the magazine pictured above, Comics Values Monthly , the title of which you can almost read, there. I actually have two issues of this magazine in the Semi-Vast Comic Archives…that one there, which I bought for perhaps obvious reasons (“Wha–!? A Syphons preview! ?”), and the other one being a special issue about the Death of Superman, of course. This was a less fancy publication than Wizard and Hero : black and white interiors, few articles, focus is on the “price” part of the mag. There’s the occasional goodie (this issue had a folded bound-in poster of its cover), oh, and just flipping through it, there’s an interview with Garth Ennis, which wasn’t as important to cover-blurb as Syphons , I guess. This mag also had an annual price guide softcover. There were other monthly (or semi-monthly) price guide magazines. Overstreet had their own Wizard -esque price-guide-with-some-articles slick covered mag Overstreet Fan . (Amusingly enough, Wizard started their own annual price guide book, competing with Oversteet’s annual guide. That only lasted a couple of years, as I recall.) I don’t really remember a lot about the quality of the articles, but I do know they sent us a pretty cool clock (with the “Fan” logo across its face) that, as far as I know, is still working and displayed on the wall at my previous place of employment. The long-running Comic Buyers’ Guide had a regular (quarterly?) price guide sometimes sealed in a polybag along with their tabloid editions. When it shifted from a weekly to a monthly, it had a price guide in the back of every issue, I believe. In practical use, we tended to stick with the Overstreet annual guide for general pricing, with reference to Wizard for any month-to-month trends that an annual guide might miss. Once other price guides proliferated, we’d occasionally use those for reference as well, but not nearly as frequently as the Overstreet annual/ Wizard monthly power pair. Nowadays, it’s mostly Overstreet I use, plus just general awareness of local market conditions. I’ll pop in on the eBay to see if anything unusual happens to stand out, though given how things are organized there, it’s easier to just look up specific issues rather than just browse and hope you see relevant data. And I know there are online price guides services…I haven’t signed up for any of those, but one I looked at had a page of “CURRENT HOT ISSUES!” that didn’t hold any surprises for me this time, but might be a handy reference for knowing which titles people are going to wanting multiple copies of. Don’t know that I really have a point to this beyond “hey, remember when there were too many price guides?” There was another thing on Twitter that I brought up, regarding the discrepancies in prices we’d often find between price guides, which was surely just a matter of differences in surveyed retailers and their own pricing trends. However, I remember my comic shop cohorts and I speculating that perhaps some guides pushed certain prices a little higher than they should have been, in order to attract more buyers. “Hey, Comics Cash Weekly lists the comics I own at higher prices than The Old Price Guide Grandpas Use … Comics Cash Weekly , you’ve got my money!” …However, clearly this would require a level of sleaziness that could never occur in the comics industry. But I do wonder if anyone actually did decide on which guide to buy based on that criteria? I mean, people have done weirder things for less reason. As for Wizard ‘s new venture…all I know about it is what I read in that article, but I honestly don’t know if “quarterly” is often enough when most big comics news/entertainment sites are updated multiple times daily. Yeah, I know they have the daily video thing, and we keep getting told video is the way everything is going, but…maybe I’m just an olds, but I’d prefer to read information online at my own pace rather than have someone talk at me. I mean, you read all this, right? …Hello? Speaking of too much to read, installment #7 of the Swamp Thing-a-Thon is up at my Patreon page, covering Swamp Thing #6 from 1973. Only one dollar a month gets you into my exclusive club, where we’re all talking about you, right now…if only you were there to defend yourself! Chris K – Oh, they certainly did. It’s not on their product page anymore, though, so everyone’s arrowhead pricing is way out of date. Is that the new Swamp Thing from the Dark Multiverse? Hero Illustrated, wow, there’s a trip into the wayback machine for me. If memory serves they were published by the same company that did Electronic Gaming Monthly, and since at that time I was huge into gaming, Hero was the one that got my money. Interestingly, my memory of them was that they didn’t make it out of 1994, but a bit of googling tells me that they actually survived until 1996. Says a lot about how my comics reading went post boom. I reluctantly admit to being a regular reader of Wizard, Toyfare, and Inquest for about three years or so. Couldn’t care less about the price guides, picked them up for the interviews and incredible levels of snark. Then I stopped because I suddenly found myself not caring anymore. The ’90s Indian arrowheads were the best–they featured holograms. Wizard’s letters page was Twitter 15 years before Twitter — half the time it was just comics’ professionals attacking one another. I loved Wizard… but it jumped the shark for me after they dedicated an entire issue to jokes about giant gorillas throwing poop.